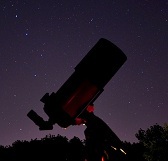 Image credit & copyright: Jerry Lodriguss. In Greek mythology the Hyades were the five daughters of the titan, Atlas and Aethra and are the half-sisters of the Pleiades who are in turn, the daughters of Pleione and Atlas. In our night sky, the Hyades is a beautiful open star cluster in the winter constellation Taurus the Bull. The loose “V” shape of this group represents the bull’s head. 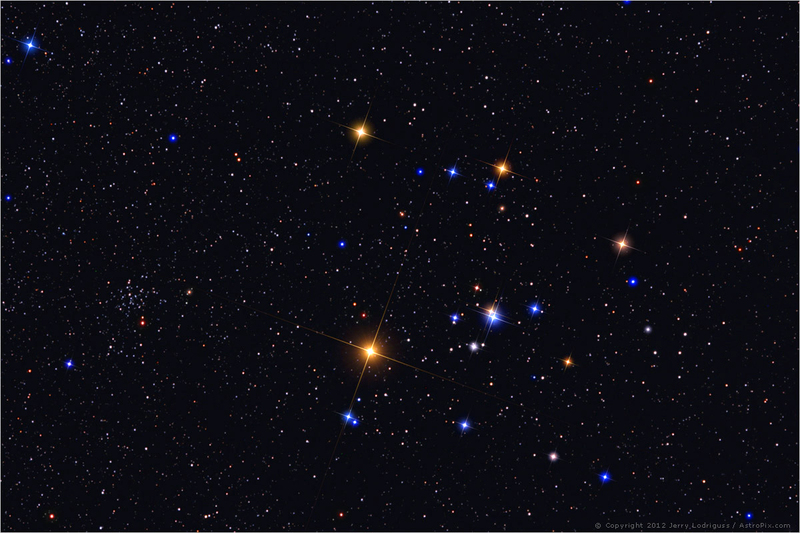 Red Supergiant Aldebaran “The Follower” (SAO 94027), represents the bull’s eye and as you follow the somewhat short body to the tail of the bull you will find the much younger (100 million years) and more distant (430 light years) open star cluster, the Pleiades or M45 (not shown). Let’s stick with Aldebaran just a moment longer. This orange giant is the 14th brightest star in the sky and at only 65 light years away, it’s not really a member of the 150 light year distant Hyades but instead, it only falls within our line of sight to it. It’s also big; with a diameter 44 times that of our Sun, you could actually fill Aldebaran with roughly 86,000 Suns even though it’s only about 50% more massive. NASA’s Pioneer 10 spacecraft is heading in Aldebaran’s general direction and should be there is a couple million years. It’s a popular thought now, that the Hyades have a sibling open star cluster in M44, the Beehive in Cancer the Crab as the two are traveling in the same general direction and they’re both some of the closest open star clusters to our solar system. Before we leave, take a look to the left side of this photo where you will also notice the 2000 light year distant open star cluster NGC 1647. This faint, yet beautiful sight is about 150 million years old, carries with it about 100 stars and resided roughly 1,800 light years away. Name (s): Hyades, Collinder 50, Melotte 25 & Caldwell 41. What is it? : Open star cluster. How old is it? : Roughly 700 million years old. How big is it? : About 20 light years in diameter containing around 380 stars and consuming 330 arc minutes of sky. How far away is it? : About 150 light years or 47 parsecs. Apparent Magnitude: +0.5 (easily visible to the naked eye). Where is it? (General): Constellation Taurus. Image | This entry was posted in Astronomy (Learning), Astrophotography (DSOs), Images, Star Clusters (Globular-Open) and tagged Astronomy, Astrophotography, Caldwell 41, Collinder 50, DanSpace77, Hyades, Jerry Lodriguss, Mel 25, Melotte 25, Open Star Cluster, Space, Star Cluster. Bookmark the permalink.